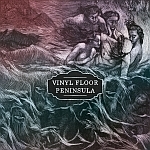 Houston Music Reviews : Vinyl Floor "Peninsula"
Vinyl Floor is Danish band, founded by brothers Thomas Charlie Pedersen and Daniel Pedersen, and colleague Rasmus Bruun. The Band created their own label, Karmanian Records, which serves primarily as a vehicle for the band's music. “Peninsula” is the band's second CD, recorded in 2011. The album was recorded in Malmö, Sweden with Emil Isaksson. The album was then mastered by Ryan Smith from Sterling Sound, New York. The CD is a concept work that is divided in two pieces or sides, as they usually appeared (for those old enough to remember) on vinyl records. Side A is “Utopia” and side B is called “Dystopia”. The cover and dreary monochromatic artwork hints that this album will be a heady piece, and so it is. The band elicits a sombre Pink Floyd vibe and occasionally a hint of prog akin to Porcupine Tree. There is also a heavy dose of originality, lacking from a lot of projects in this realm. The old adage “to make money, you have to spend money” applies here as well, as the top class engineering on this album takes it on a completely different level. The production sounds vintage in a good way (it breathes) with lots of warm instruments, great piano and orchestration parts, enhanced by a wide array of guest musicians, including a contribution by the Vindla String Quartet. The performances overall are very convincing although of a more melancholy character, which at times gets downright depressing. I personally prefer more light and shade than presented here, especially considering that we are presented with the difficult philosophical and sociological concepts of Utopia/Dystopia. Solid performances and sonics throughout. My fave tune : “Ghost of England” .